I hiked to Koko Head and Makapu‘u along the Ka Iwi Coast of East O‘ahu to see ‘ihi‘ihilauakea, an endangered fern endemic to Hawai‘i that comes to life during ho‘oilo — the rainy season. 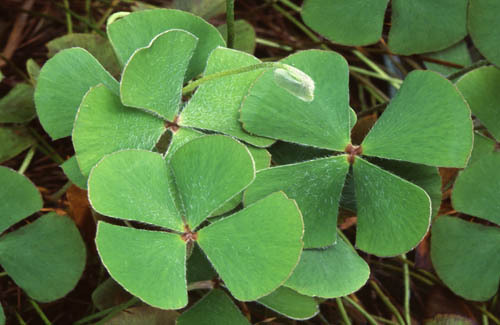 ‘Ihi‘ihilauakea or villous water clover (Marsilea vilosa) is a rare native fern that has evolved to survive alternating conditions of flooding and drought. The plant grows in dry areas of the island and is known to grow in only a handful of locations on O‘ahu and Moloka‘i. 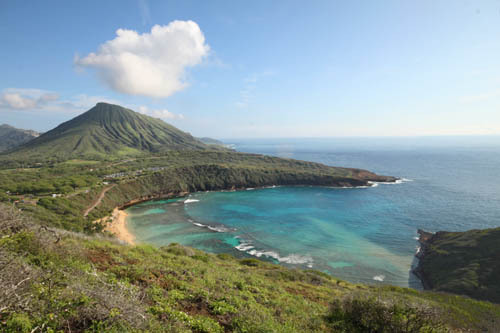 A small crater on the southern rim of Hanauma Bay is the ancestral home of ‘ihi‘ihilauakea, and is named after the fern. 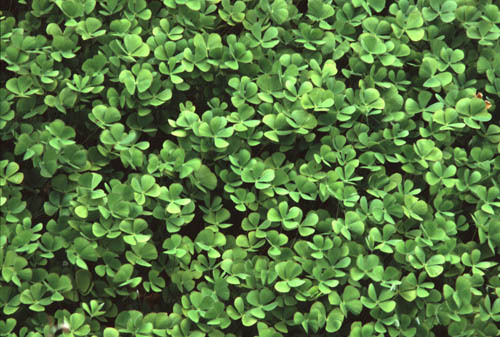 When ‘Ihi‘ihilauakea Crater fills with standing water, the spores germinate, and the ephemeral pool becomes a veritable sea of four leaf clovers. Since the rainfall over Oahu has been heavy over the past few weeks, I decided to see if enough rain fell over Koko Head for ‘Ihi‘ihilauakea Crater to flood. The crater does not fill with water often, filling on average only once every 6-1/2 years, but decades can pass between flooding. The last three documented floodings of ‘Ihi‘ihilauakea Crater occurred in the winters of 1987-1988, 1990-1991, and 2003-2004. Starting from the entrance to Hanauma Bay, Nikolaj, Noah, and I hiked up the paved road up towards the top of Koko Head. We then veered-off the ridge line and dropped down to the southern rim of the bay where a pair of small craters reside on the rocky point — the larger of two being ‘Ihi‘ihilauakea Crater. Unfortunately, it had not rained hard enough over Koko Head for the crater to fill with water. But even though the crater did not flood — which is necessary for fern spores to germinate — we saw 3 small patches of ‘ihi‘ihilauakea whose plants can lie dormant and vegetatively come back to life. In order to give the patches more space to grow, we removed weeds from the muddy soil where the ferns were growing. Since the crater at Koko Head did not flood, we decided to visit another population of ‘ihi‘ihilauakea ferns several miles down the Ka Iwi Coast in Makapu’u, where a pool floods with greater regularity. After parking near the Makapuu Lighthouse trail head we made our way to the base of a small hill where an ephemeral pool fills with water for several weeks at a time after a big rain. 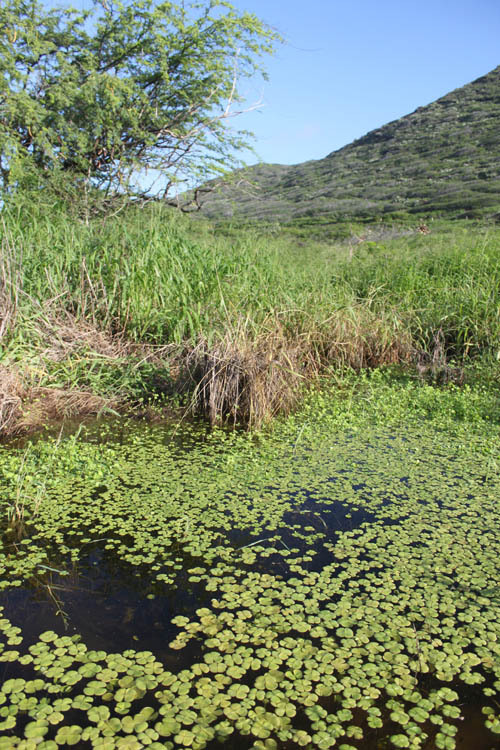 We were thrilled to see the surface of the pond covered with the floating fronds of ‘ihi‘ihilauakea which resemble four leaf clovers. Botanists say the spores must be submerged in order for them to germinate. Since the pond was about 1 foot deep, I assume at least some of the plants had germinated from spore. During the fern’s aquatic stage, the fronds have long supple stems and their fronds — which are no more than an inch and a half across and look like four leaf clovers — float on the surface. Since I had my goPro camera which can take underwater video, I placed the camera in the water to see what the ferns look like beneath the surface of the water. While examining the fronds on the surface I saw several endemic pupu kuahiwi or amber snails (Succinea caduca) about a quarter inch long crawling on the fronds swimming from pad to pad. 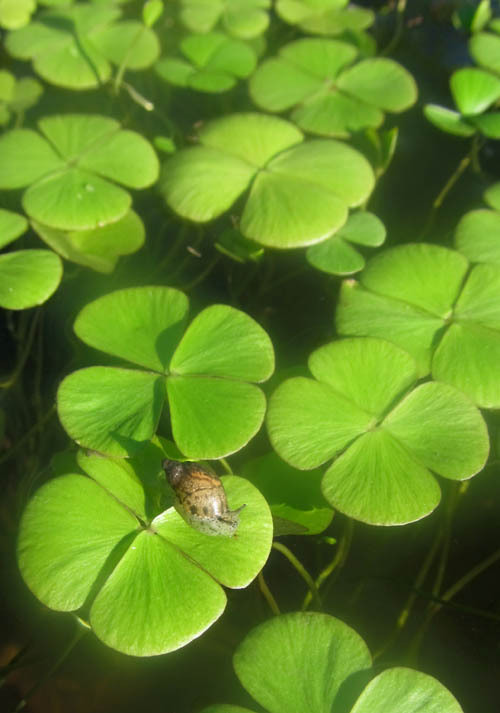 While I knew the snails were able to survive dry periods by sealing themselves in their shells until it rains, I had no idea they were so adept in the water until now. The ephemeral pool will eventually dry out, and the ferns will undergo a more terrestrial stage. The photo above was taken several years ago after the standing water had evaporated. The ferns were closely packed together in a dense growth that they almost entirely crowded out the other plants. During this terrestrial stage where the ferns grow in dry soil, the stems stiffen and tiny hairs grow in the surface of the fronds. With the pool drying out and their life cycle coming to an end, the ferns reproduce sexually to create spores that lie dormant until the next big rain that fills the pool with standing water — which can be decades later. What an amazing native fern! This blog post contains snipets of a larger video. If you are not already video’ed out, here is the larger 4 minute video on ‘Ihi’ihilauakea. ‘Ihi‘ihilauakea from Nate Yuen on Vimeo. Thanks for sharing your beautiful art with us! This is great information and valuable data. Like you, been to the crater several times after heavy rains, but haven’t caught their full blown foliation as yet. Like the underwater shot. Thanks for this great blog post! I am a PhD student at UH and my dissertation is on conservation of ‘ihi’ihi. My primary field site is the population out at Lualualei Naval Base. We also had some moderate flooding out there last week, a relief after such a long drought. Your underwater shot is very cool – and it’s great that you observed the native snail too. Fascinating Nathan. Great videos! Thanks for sharing. Loved this. Heidi sent it my way. I will ask her to take me hiking there next time I visit Oahu.